"Catching More Muskie and Great Northern Pike with a Legend's Rules of Fishing" is on sale now! Freshwater Hall of Fame fisherman, "Muskie Bob" Brunner was a living legend around Lake St. Clair, Michigan. Bob knew more about Muskie and Great Northern Pike fishing than anyone in the world today. 65 Pages of "direct to the point" info you need, including "Lake St. Clair Hot Spots", along with color photos of Bob's favorite lures for only $24.95 + postage. Running a successful Lake St. Clair charter business for decades, and fishing 100's of lakes around the world, Bob shared his experience to help you understand every aspect of fishing for these fresh water predators so you too will feel like an expert! Are you ready to make that big catch you'll remember the rest of your life? Presentation - Rods - Reels & More! 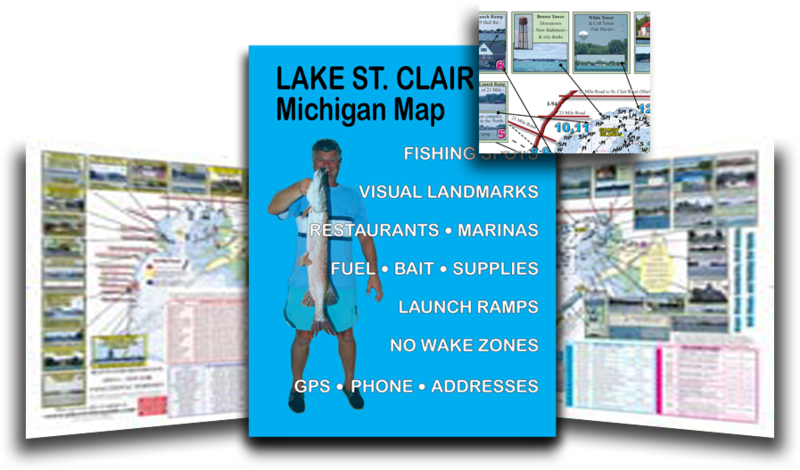 And, for only $4 more, compliment your book purchase with the 2 Sided 17x20" Lake St. Clair Map which highlights several more fishing areas, and includes 80+ photos of visual landmarks around the lake, GPS for fuel, bait, DNR launch ramps, no wake zones, restaurants, marinas, and more!